Contact the Rennie Keates who is the director of the Gathering Place and ask her to stop making the homeless starve for over a half day on a daily basis. Plus contact the West End MLA Sam Sullivan. His email is sam.sullivan.mla@leg.bc.ca. 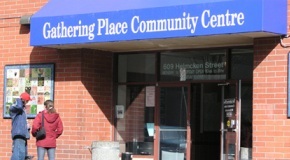 We recently wrote about The Gathering Place and how it makes the hungry and homeless starve by making them wait 15 hours between meals. However on Thanksgiving Day not only they were charging money for Turkey Dinner but did not make enough and ran out in 20 minutes causing many hungry and homeless to leave hungry and depressed causing them to go without food for 20 hours !! Rennie Keates must apologize for this incident and resign. She already has no problem making the hungry and homeless wait 15 hours between meals, but on Thanksgiving she raised to 20 hours. Thanksgiving is once a year but Rennie Keates had no problem for only making dinner for a dozen or so people. Rennie Keates should answer to why so many hungry and homeless suffered on Thanksgiving. Contact the Rennie Keates who is the director of the Gathering Place and demand she resigns. Her Thanksgiving act was the tipping point.